SQL Server Reporting Services is a popular choice for creating, deploying, and managing reports. But there are many occasions when it is an overkill or the data source is not SQL Server. Sunset Reports provides an attractive alternative that provides most of the features of SSRS and many features that SSRS doesn’t provide. Sunset Reports is easier to learn, is simple to install and use, and is less expensive. Sunset Reports provides a great award winning Report Designer, a powerful visual query builder, the ability to connect to almost any database, a huge list of export and file formats, and numerous features to deliver the reports to the user. Sunset Reports can act as a report server with a true Windows based process running in the background. 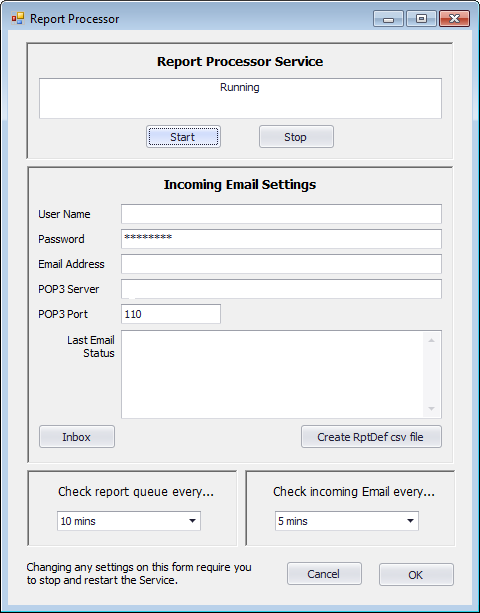 As a report server it can push reports to users, but it can also respond to emails when a user wants to pull a report. With the ability to schedule reports and have them queued up, you have everything you need to manage document delivery. And since reports can also be saved as a web page, Sunset Reports can build web pages and FTP them directly to your website. So if you are looking for another option besides SSRS, or any other report designer, then look carefully at Sunset Reports. 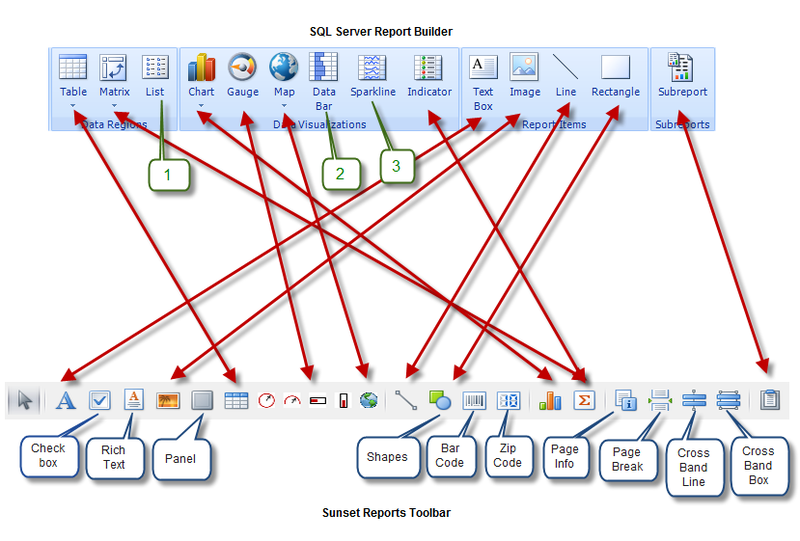 In the following figure we have compared the report designer toolbars between SQl Server Report Builder and Sunset Reports. The red arrows show a match with the toolbar items between the two software programs. SQL Server only a rectangle as a shape while Sunset Reports provides 23 shapes. The items on the bottom of the figure with a blue callout show items that Sunset Reports has and SQL Server does not have. We talk about how Sunset Reports is simple. Let’s illustrate this point. For the large companies that use MS SQL Server, they use a powerful tool called SSRS (SQL Server Reporting Services). This is integrated with SQL Server and requires a fair amount of understanding. Just look at all the tools that are needed for SSRS: Power View, Report Designer, Report Builder, Reporting Services Configuration Manager, SQL Server Mangement Studio, SQL Server Configuration Manager, Rsconfig Utility, Rskeymgmt Utility, Windows Management Instrumentation (WMI) Classes, SharePoint Central Administration, PowerShell Cmdlets, Report Server Web Service URL, Report Manager, RS Utility (References). That is 14 different tools. Sunset Reports keeps it simple with just one tool. Everything you need is available from a single program. Installation is simpler, training is simpler, etc. Now we do not say that Sunset Reports is as powerful as SRSS, but it can handle most of what SRSS provides and is more than enought for most small businesses. It is simpler and that translates to cost and time savings.